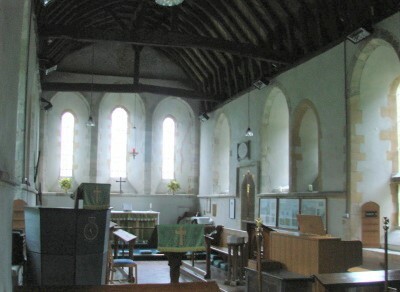 The nave and western chancel are probably C12. In the C13 the nave was extended to the west with a tower and aisles and the chancel was lengthened. The aisles were removed, probably in 1608, re-using the C13 windows. There is a C14 screen. Thorney Island housed a Royal Air Force base until 1976 and is today an Army base, so access is controlled (ID with picture essential). It is surrounded by water at high tide and because of erosion on its eastern side, the church is near the shore. It is recorded in Domesday Book (6, 1), but nothing remains of this date. The small north window of the western chancel is round-headed and its sill and head are of a different stone; the equivalent south window is pointed, so assuming they date from the same time, this must be c1150 or later. The east part of the nave may also be C12, though Peckham suggested there was then only a single cell (2 p88). The blocked north arcade extends to the west end, so at the latest the lengthening of the nave took place when this was inserted. The exposed piers have early C13 narrow abaci with a single order on the heads. Less of the south arcade is visible but what is to be seen looks similar in date and the short, unbuttressed tower is little later. 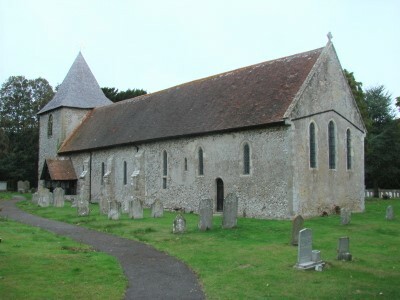 As wide as the nave, possibly to ensure stability on the marshy ground, it recalls others near the coast, like Yapton and Rustington. However, it is later and plainer, with large, pointed openings enclosing two smaller ones, with moulded capitals and shafts. The rere-arches of the lancets in the lower stage have alternating light and dark stones, providing a link to the chancel. The pyramid spire, which becomes steeper part way up, rests on a corbel-table, of which only part can be made out. The double-chamfered tower arch has responds of three clustered shafts with moulded capitals. Excavation revealed there had been a narrow south aisle, which doubtless had a lean-to roof (VCH 4 p196). Part of the west wall survives as a buttress, but nothing else. Nothing of the north aisle was found. The blocked arcades contain reset lancets, of which one north one is round headed; the other, larger one has a moulded surround and could have been a west or east one. They have slight scoinsons, not usually found as early as this, though as they are reset, they may not be in their original state. One rere-arch incorporates a C12 capital, with a triangular moulding. The south doorway is plain and the north one has dogtooth moulding on the hoodmould. The surviving detail of the nave and aisles is early C13, as is the eastern part of the chancel, with lancets and a plain round-headed south doorway. The centre of the three stepped east lancets is barely taller and all rere-in arches in the chancel lack scoinsons. On each side is a lancet with a transom and a low sill. East of the original side-windows are two lancets, which are linked by a string-course at sill-level to the east ones. 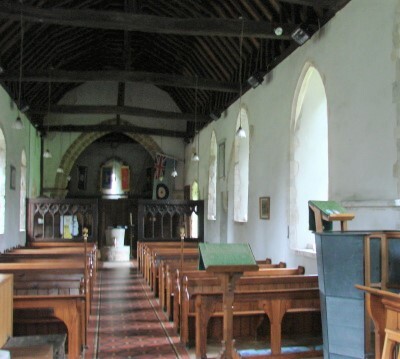 There is no chancel arch and the roof is continuous over nave and chancel, making the inside appear long and narrow. Repairs in 1608 probably include the present crownpost roof and the removal of the aisles (ibid), though other churches on the coastal plain had been shrinking since the C14 and the lack of foundations of the north aisle may mean it disappeared earlier. The Sharpe Collection drawing (1805) shows a square-headed south east window in the nave and an open timber porch. A light restoration in 1886 (CDK 1888 pt 2 p140) by L W Ridge cost £800. He exposed the blocked arcades and altered the south east angle of the nave, where there is a lancet. The roofs were boarded and the south porch replaced. Some walling was rebuilt, for the east respond of the south arcade was heightened with stones, said to have been taken from it (VCH ibid). The church retains a civilian congregation and is also used by the army. It is in good repair and in 2009 the spire was renovated. 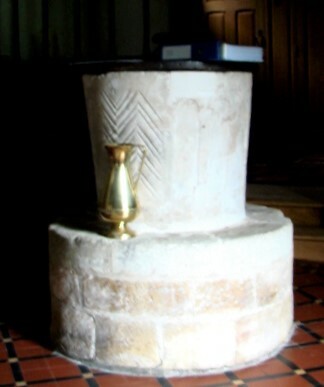 Aumbry: (South chancel) Although adjacent to the piscina and not opposite, this square recess lacks a drain and can hardly be anything but an aumbry. Bench and cupboard: (Tower space) A curious C18 piece, combining both. Door: (Displayed in sanctuary) The south door, probably C13, is preserved. Font: Tall mid-C12 tub with arcaded sides, except the front, which has chevrons. It recalls that at Yapton. Mass dials: (South chancel doorway) At least three, divided between the jambs. 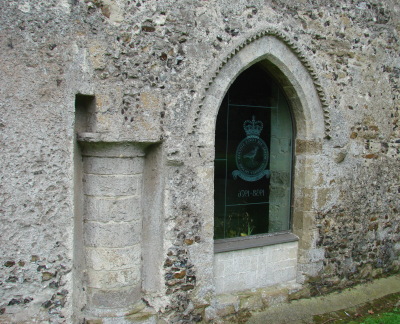 Monument: The previously blocked north doorway was glazed in 1976 with the engraved badge of the RAF station and reveals the tombs of British airmen in the churchyard. The setting is by T E Roberts (WSRO Par 196/4/9). Piscina: (South chancel) Small and pointed C13. Pulpit: J Skelton, 1962 (ibid Par 196/4/7) with tapered sides covered in slate panels. Royal Arms: (North chancel) Square painted panel. Inscribed simply GR, it could date from any time between 1714 and 1802. 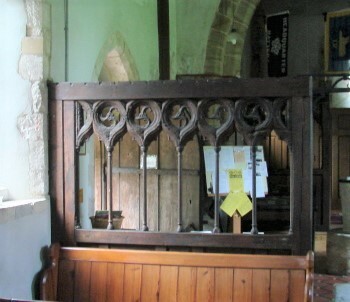 Screen: (Reset at west end) C14 in a C19 surround and originally a parclose. The shafts are replacements, but not the top with cusped ogee heads. The circular spaces above are divided into three mouchettes. Adelaide Tracy (I p7) (1850) shows it in a division between nave and chancel, arranged in two tiers with additional linenfold panels. These suggest the division was assembled in the C16 or C17, perhaps as part of the work in 1608.